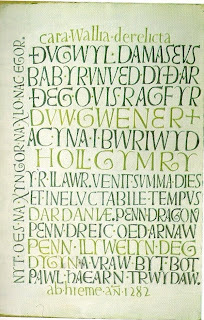 David Jones’ lettering, as illustrated by the above example, is very much a visual ‘showing forth’ of literary, cultural and spiritual concerns. It makes present in concrete form, makes a ‘shape of meaning’ out of the materials the artist has to hand, of things that are important to him. First there is the showing forth of language. Then of literary and historical reference. Finally of the design itself. Typically, David Jones would use elements in his inscriptions from Welsh, Latin and English to convey the historical elements- Celtic, Roman and Germanic - that he saw as contributing to the historical background of Britain and the whole of Europe. Here only Welsh and Latin are used to emphasise the continuity of succession between the early Welsh princes and the Roman Empire, a succession brought to an end by the death of Llywelyn in 1282 and his replacement as prince of Wales by the son of the King of England. In the inscription above the Welsh from the elegy written by Gruffudd ap yr Ynad Coch following the killing of Llywelyn, sets the theme for the piece. But it is bound around with other Welsh words from Brut y Tywysogion and Latin both from Virgil and of David Jones’ own devising. These are the lines at the top and bottom which frame the piece. David Jones rendered them himself in English as "Dear Wales, all buggered up" (though 'forsaken' would be a more literal translation) at the top and "since Winter 1282" at the bottom. This captures the sentiment of the elegy that Llywelyn's death was an unmitigated disaster and an entire end of things for Wales and the Welsh. As the words from the Brut set down here put it: "on the eleventh day of December ... all the Welsh were cast down". The theme is further developed and modulated to a more universal context by the Latin from Vergil's Aeneid: "And the end of the days of the ineluctible time of Troy has come". Not only does this provide a parallel for the sense of enormity of the death of Llywelyn and a comparison with that of Hector and its consequences for Troy, but it also evokes the whole range of associations about the legendary founding of Britain by Brutus as set down by Geoffrey of Monmouth. Note, these are not specifically included, but are part of the associative matter that the technique of allusive construction (pursued by David Jones both in his artistic and his literary works) makes possible. Only then do we come to the words of the Elegy: "A Leader's head, a dragon's head upon him, head of fair, stubborn Llywelyn, a shock to the world that an iron stake should be through it." Further words from the Elegy appear along the side of the inscription: "There is no counsel; no lock, no opening". Moving from content to design, notice how certain letters are given prominence, how colour highlights certain words. This is slightly problematic as most reproductions of this piece seem to have mispresented the colour balance, shifting green to red for instance. And no reproduction of his paintings quite captures the translucence that the large amount of chinese white that he used as a base gives them. But it is still possible to appreciate the way the colours change to emphasise certain phrases and to see the way that some letters stand out from the crowded lines, much more crowded than some of his other inscriptions. Somehow, in spite of this, the whole thing has a perfect balance about it, hanging together as the letters jostle for position and find an equilibrium of their own. Form, content and allusive meaning are all perfectly matched.